Despite one of America’s top generals calling the World War II Jeep “America’s greatest contribution to modern warfare,” the little 4x4 wasn’t perfect. In fact, it rolled off the assembly line in 1941 with a terrible design flaw that could have sent soldiers barreling into oncoming traffic. I recently drove a World War II Jeep for the first time and experienced something I had only read about on the forums: a potentially dangerous pull to the left during braking that required some serious counter-steering to avoid veering into the oncoming lane. While I can’t vouch for how well that particular Jeep’s brakes had been adjusted, just take a look at this video clip I randomly found showing a soldier in 1940s Berlin struggling to bring his Jeep to a stop in a straight line. Clearly, this was a pretty egregious engineering flaw. To understand the cause of the Jeep’s tendency to yank to the left, we have to take a look at the war hero’s steering system. As the end of that pitman arm swings in an arc, it pushes and pulls a drag link (just a long metal rod), which rotates the axle-mounted bellcrank, thus pulling or pushing the tie rods. Those tie rods ultimately rotate the knuckles and the wheels connected to them, allowing the driver to steer. Here’s a look at the system, starting at the drag link (labeled “1") and ending at the knuckle (labeled “4"). The problem with this system has to do with a phenomenon called “axle wrap,” the tendency of a leaf-sprung axle to twist under braking or acceleration (here’s a video of it in action). Since the Willys MB and Ford GPW don’t send a lot of power to the wheels (especially in four-wheel drive), axle wrap under acceleration isn’t really an issue. But under hard braking, it definitely is. As the driver stabs the brakes, the Jeep’s axle rotates towards the front of the vehicle, and it wants to take the bellcrank along with it. Since the drag link—which connects to the frame-mounted steering box on one end, and the bellcrank on the other—doesn’t move unless the driver turns the steering wheel, the bellcrank will have a tendency to want to rotate under braking as the axle twists. This will put the driver’s side tie rod in compression, and the passenger’s side tie rod in tension, thus turning the Jeep to the driver’s side, potentially into oncoming traffic. As a band-aid, sometime in 1942, Willys Overland and Ford started installing a “Torque Reaction Spring” under the driver’s side front leaf spring pack (the torque reaction spring is labeled “7" above). The torque reaction spring helped, but many say it didn’t fix the problem entirely. 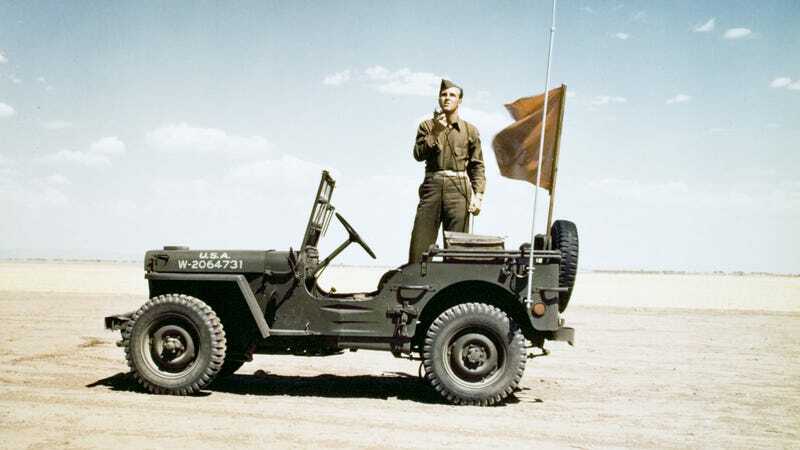 It really wasn’t until the war ended and Willys Overland launched its civilian model Jeep—the CJ-2A—that the company fixed the problem by taking the bellcrank off the axle and bolting it to the front crossmember. Why the company waited until the end of the war likely has to do with a desire to maintain commonality between all vehicles in the field, and to prevent any slow-down in production due to such a major design change. As for why Willys let this example of poor engineering out of the factory in the first place, I’m not sure. I could speculate that the time crunch with the war on had something to do with it, but that’s just speculation. While this setup wouldn’t seem to be as sensitive to axle wrap as the World War II Jeep’s design, it also leaves quite a lot of steering components hanging low to the ground. Presumably, the change to an axle-mounted bellcrank was seen as a benefit from an off-road durability perspective. Unfortunately, that move ended up being arguably the Willys MB’s and Ford GPW’s biggest design flaw. And even today, when collectors smash the brakes on their classic World War II Jeeps, they keep their hands ready to crank that spindly little steering wheel to the right. Because the last thing you want to do is wreck a vehicle as glorious as a World War II Jeep. Willys Jeeps Are Excellent. Despite Their Flaws.